Mangaluru, Dec 14, 2015: Shalon Joanne Pais wins the first-ever NBJ Yuva Pratibha Puraskar 2015 instituted by Mavis and Calvin Rodrigues in the name of ‘Akash-Amulya’, to mark the celebration of stepping into the 7th year of the publication of the Konkani monthly magazine (in Kannada script), Naman Bhallok Jesu (NBJ). The release said, NBJ Yuva Pratibha Puraskar is aimed at identifying and recognizing talent Catholic youth in the age group of 18-30, who have made outstanding contributions and achievements in different fields such as Sports, Literature, Arts, Science, Agriculture, Entrepreneurship, Social Service, Environmental Protection etc. This Award consists of Rs. 25,000 cash, a citation and a memento. The 18-year-old Shalon Joanne Pais, daughter of Mr John and Mrs Margaret Pais of Bajjodi - Mangaluru, who is now pursuing her B.A. LL.B at SDM Law College, Mangaluru. An exceptionally talented youngster, Ms Shalon has won laurels in Chess consistently winning top positions in National School Games since the last 6 years from the 54th National School Games in 2009 (third place), second place in 55th, third places in 57th and 58th and in the 60th National School Games in 2014. She has secured the Best Female Player award in the 2014 International FIDE Rated Open Tournament and also in the 2015 International FIDE Rated Open Tournament besides the 10th place in the National FIDE Rated Open Tournament last year. 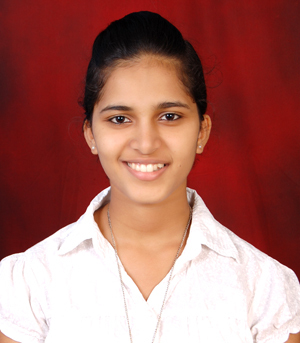 She has also secured the 6th place in the Asian Youth Chess Championship 2005, secured the Silver Medal in 2010 National School Chess Championship, when she represented Karnataka as Captain, Bronze Medal in the National SGFI Chess Championship of 2015 and Karnataka State Women’s Champion in 2012. She has also excelled in music playing violin and piano besides singing, dancing and public speaking. NBJ Yuva Pratibha Puraskar2015 will be conferred on the Shalon Joanne Pais on December 20, 2015, at the Infant Jesus Shrine at Bikkarnakatta, Mangaluru, during the Anniversary Celebration of Naman Ballok Jesu monthly magazine. The award presentation function will be presided over by Rev. Fr. Charles Serrao, OCD, Provincial, Karnataka and Goa Province. Noted Konkani and Kannada columnist and Director of Fatima Retreat House, Fr Prashant Madtha, SJ, and Rev. Fr. Denis D’Sa, PRO, Udupi Diocese, will be the chief guests. Apart from the conferring of the awards, the Konkani website, www.sokallik.com, will be launched and four books will be released, said the release. Congrats! Shalon Joanne Pais for your contribution and achievements at such a young age.